One could be forgiven for assuming, based on title alone, that Dogman is yet another superhero movie. There’s a lot of them out there right now, after all, especially this month. But one look at the main character of this simmering new drama from writer-director Matteo Garrone (Reality, Tale Of Tales) should dispel any such misconceptions. So, too, would any familiarity with the work of the filmmaker, though after putting a very grim spin on the Brothers Grimm, tackling Stan Lee wouldn’t be such a stretch. Marcello (a remarkable Marcello Fonte), who runs a pet-grooming business in a seaside neighborhood of an unnamed Italian city, has the physique of a pre-serum Steve Rogers: He’s short and scrawny, with a haircut that only further underscores his somewhat childlike appearance and demeanor. (We don’t learn much about his family history, but if Marcello has siblings, he’s definitely the runt of the litter.) Temperamentally, the guy’s even less intimidating—a total softie who dotes on his young daughter (Alida Baldari Calabria) and the dogs he cares for at work and at home. The closest thing to a superpower that Marcello possesses is an almost canine-like loyalty and good-naturedness, his willingness to forever turn the other cheek, lend a helping hand, and see the good in those around him. But then, in the wrong light, that trait can look as much like an Achilles heel as a strength. 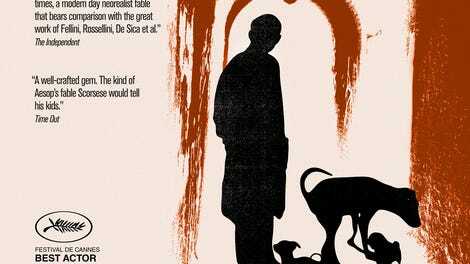 Dogman is all about the “friendship,” to put it very generously, between Marcello and his opposite number, the brutish ex-boxer Simone (Edoardo Pesce). Standing next to each other, they almost look like a classic comedy duo—or perhaps more relevantly, like the big and small dogs, Spike and Chester, from Looney Tunes. However exaggerated their difference in size, the imbalance of power between them is even more pronounced. Simone, a bulldozer of pure appetite, takes daily advantage of his diminutive companion, shaking down Marcello for money and drugs, and even roping him into his petty criminal schemes, at one point forcing the groomer to play getaway driver for a B&E job. Admittedly, the barbaric lug tends to lean on everyone—he terrorizes the whole community with his thieving and fighting and bullying, to the point where the other business owners are ready to consider just having him killed. But Marcello, total teddy bear that he is, hasn’t the heart to agree. Garrone made his big international breakthrough with Gomorrah, which looked to expose, in nauseating detail, the full degree to which organized crime has clogged the arteries of Italian society. It was the gangster movie as hellish procedural. 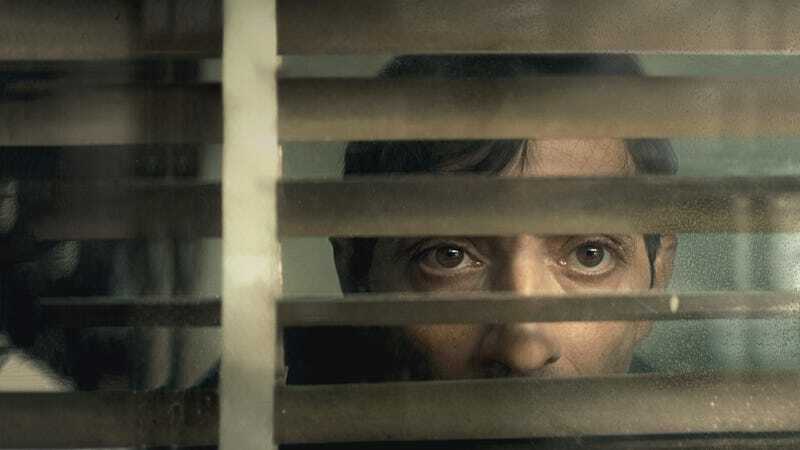 Dogman returns the filmmaker to a crime-world milieu, a space of corruption and coercion, but the scope and stakes are much smaller—condensed into one toxic, parasitic relationship. That turns out to be something of a double-edged sword. Though the film mostly works as a cautionary tale about the dangers of misplaced loyalty and the limits of being the bigger man (figuratively speaking, in this case), Garrone files it to such a sharp point of narrative simplicity that only one particular outcome seems possible. Some might call that fatalistic. You could just as easily call it predictable, and the final act—when the decent-to-a-fault Marcello runs up against the furthest limits of his compassion and forgiveness—feels like a failure of imagination. All the same, Garrone tells this familiar tale with cold, mesmeric craftsmanship: Dogman is a handsome bummer, matching the darkness of its subject matter with the rich shadows of Nicolai Brüel’s contrast-heavy cinematography. What it really has going for it, though, is one hell of a lead performance. Fonte, the film’s largely unknown star (he only has a few credits to his name at this point), won a deserved Best Actor prize at Cannes last year for his richly shaded work, for the way he slowly dims Marcello’s light and tugs down on his goofball grin. It’s a small, heartbreaking symphony of crumbling ingratiation: the portrait of a good man trying to cling to his principles in the face of stubborn, selfish immorality. There are no superheroes here, but Dogman is an origin story of sorts, at least for a great actor unleashing his inner Hulk.